If you haven’t seen the video where the range rover runs over bikers you must be living under a rock somewhere. The madness started when an annual motorcycle ride put together by a gang known as the Hollywood Stuntz attracted hundreds of bikers. The ride seemed to be going peacefully as the bikers crammed the road, but suddenly things took a turn for the worse when a Range Rover impeded the forward progress of the ride. 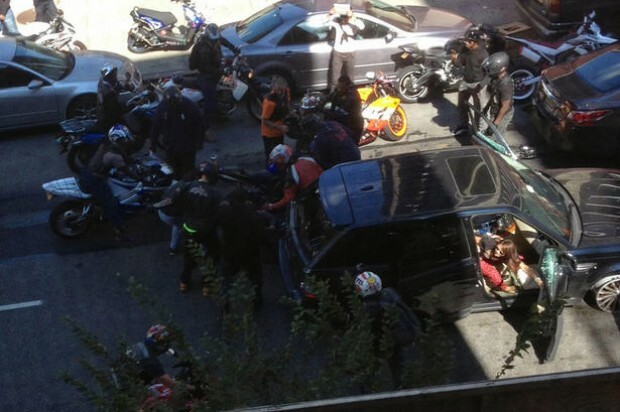 Police accuse one of the bikers of pulling in front of the Range Rover and cutting it off. This biker was hit because the range rover didn’t have enough time to stop. The other bikers then surround the Range Rover. In particular, one biker produced a knife and slashed at the range rover’s tires. At this time, the range rover runs over bikers and the chase starts. 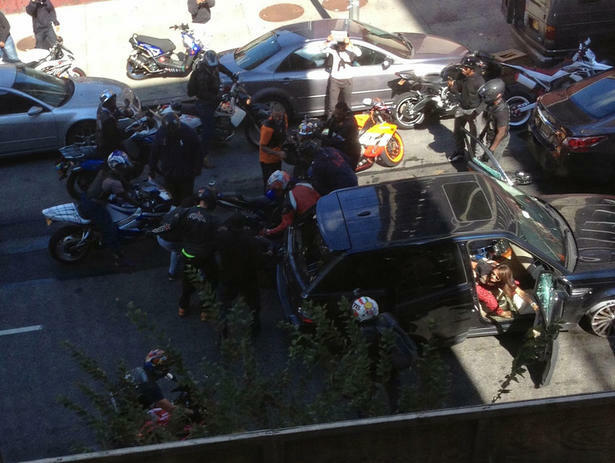 Luckily for us, one of those bikers had a helmet cam recording during the ensuing melee. With hundreds of bikers now following close behind the driver Range Rover continues to barrel down the highway. Unbeknownst to most of the bikers, the man in the Range Rover is not alone. In fact, he is with his wife and young daughter enjoying what was a simple Sunday outing. On this note, I completely sympathize with the driver of the Range Rover. With his wife and family on board he really had no choice but to try and protect them. However, at the same time, I do somewhat sympathize with the bikers who gave chase (but not the bikers who ultimately beat Mr. Lien.) If I was taking part in a bike ride and all the sudden a range rover runs over bikers in my group, I would certainly give chase as well. After the initial incident the chase appears to be coming to a close when a car pulls in front of the Range Rover. Quickly, a biker hops off his bike and tries to commandeer the Range Rover. Again, the Range Rover runs over bikers and speeds away. This is yet another situation in which I sympathize with the driver of the Range Rover. Had the bikers maintained a safe distance and waited for police to arrive, that would have been another story. But the moment they tried to enter Mr. Lien’s vehicle is the moment they crossed the line. Finally, the Range Rover takes a wrong turn and ends up stuck in traffic on a NY City side-street. Apparently, the couple did contact police at some point during the chase, but police were unable to locate them. Perhaps more disturbing is the recent revelations that at least one undercover NY city police officer was on hand while Mr. Lien was beaten to a pulp. Personally, I would never have gotten off the highway as Mr. Lien did. On the highway the driver of the Range Rover had an advantage, but on the side streets stuck in traffic, he was just a sitting duck. It remains to be seen which of the bikers will face charges, and to what extent, but this case should certainly be interesting to follow. Range Rover runs over bikers caught on video!